Almost all Royal Navy ships have affilations to towns, cities and various organisations. Many of Ark Royal V's affiliations were inherited from previous ships to bear the name. Situated in West Yorkshire, Leeds is the third largest city in the United Kingdom. The city's association with HMS Ark Royal stems back to the Second World War and Ark Royal III. In November 1941, as part of a government campaign to raise money for the war effort, Leeds decided to adopt the aircraft carrier Ark Royal. Unfortunately, within just a few days of adoption, the ship was torpedoed and sunk off Gibraltar. As a result of the tragedy the people of Leeds set about raising money for a replacement ship, eventually raising an amazing sum of more than £9,000,000. Ark Royal IV was granted the Freedom of the City of Leeds in 1973 and this honour was eventually transferred to Ark Royal V.
This affiliation was originally established in 1985, as Ark Royal was coming out of build, with the 17th/21st Lancers which subsequently amalgamated with another regiment to become the Queen's Royal Lancers. The Queen's Royal Lancers is an Reconnaissance Regiment operating the Scimitar armoured reconnaissance vehicle. Over the years there have been many events to promote this affiliation, including medium term loan drafts, ship visits, sporting events and the regimental band playing at various Ark Royal social events. 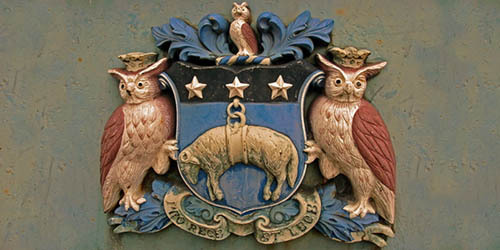 The Worshipful Company of Shipwrights is one of the ancient Livery Companies of the City of London. Its full title, recorded in the Ordinances, is 'The Ancient Fraternity or Brotherhood of Free Shipwrights of London'. Their motto is "Within the Ark safe for ever". An affiliation with the Red Arrows was established in 2001 as Ark was emerging from her first refit. The Fifty Fund is a charity that restores and maintains old locomotives including 50035 Ark Royal. The affiliation was originally established by Ark Royal IV. Another affiliation inherited from Ark Royal IV for obvious reasons. The Association held their 60th Anniversary Dinner on Ark on 13th November 2001.